The Iranian morality police arrested woman for immoral conduct -- wearing nail polish. The morality court fined her, but lashes were not ordered. The Iranian morality court has fined a woman $224 for the immoral act of wearing nail polish in public on “four and a half” of her fingers. She also was ordered to pay an additional $250 each for three other offenses – wearing a short jacket, wearing it in bright red and green colors, and wearing make-up. The fine for nail polish was calculated at the rate of $50 per finger. She also must pay between $500 and $1,500 for her hair being toned in a light color, and $180 for wearing glasses over her hair. The court did not order that she be lashed, a frequent punishment in Islamic law. 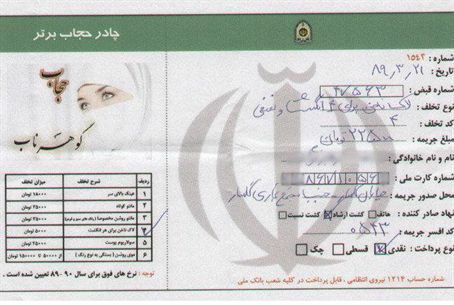 The report of the fine and a picture of the guilty woman’s identification card were provided by the Iran Focus web site, which said that the woman was arrested by the “Guidance Patrol” near a commercial complex. Iran recently has stiffened its control over public conduct among women, and police have issued warnings to 62,000 women for being improperly veiled in the province of Qom, the center of Iran’s Shiite clerics. An Iranian newspaper quoted police chief Colonel Mehdi Khorasani as saying that his officers confiscated approximately 100 vehicles carrying women who were improperly dressed, noting that "encouraging such relaxations are among the objectives of the enemy." The crackdown on women contradicts a recent statement by Iranian President Mahmoud Ahmadinejad, who said he is "firmly against such actions [because] it is impossible for such actions to be successful." The Washington Post reported earlier this month that hard-liners in the Islamic Republic have become more influential since last year's re-election of Ahmadinejad, a victory that was widely viewed as the result of a rigged vote. By law, women in Iran must be veiled and wear long coats when in public. Following the 1979 overthrow of the Shah, under whose reign mini-skirts were not uncommon, Islamists began beating women who were not veiled. After Ahmadinejad became president four years ago, the Guidance Patrol began enforcing dress codes, but it has not been able to impose its will on the entire population.